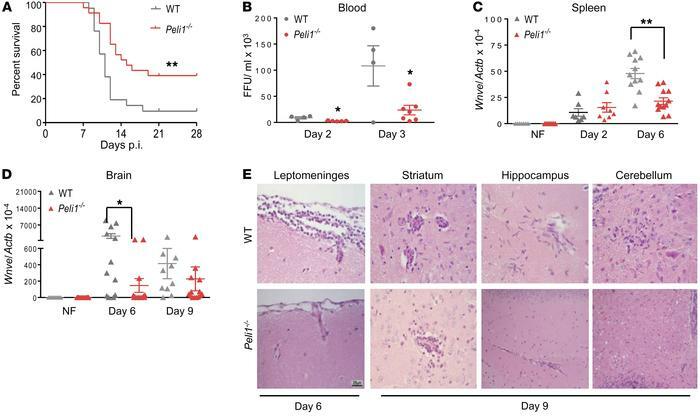 Peli1–/– mice are more resistant to lethal WNV infection. (A) Survival of WT and Peli1–/– mice after i.p. injection with WNV 385-99. n = 21 WT mice; n = 23 and Peli1–/– mice. **P < 0.01 compared with the WT group (log-rank test). (B) Viremia was determined by FFA on days 2 and 3 p.i. Data are presented as the mean ± SEM (n = 3–6) of samples collected from 1 representative experiment of 3 similar experiments. (C and D) Viral loads in the spleens and brains of infected and noninfected (NF) mice were determined by qPCR. Data are presented as the mean ± SEM (n = 7–12) and were collected from 3 independent experiments. (B–D) *P < 0.05 and **P < 0.01 compared with the WT group (unpaired, 2-tailed Student’s t test). (E) Representative H&E-stained images are of brains collected from 4 or 5 WNV-infected mice per group at the indicated time points. Scale bar: 25 μm. Original magnification, ×20.